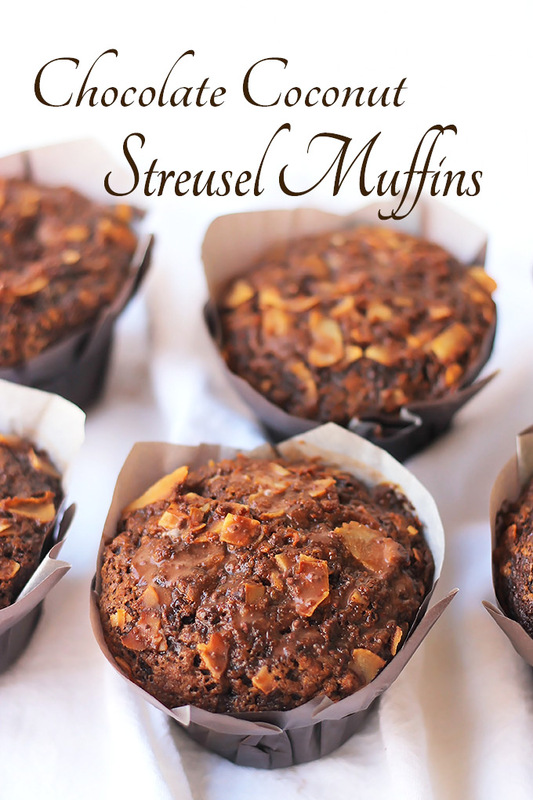 If you’re a Chocolate Lover, you are going to love, love, love this Chocolate Coconut Streusel Muffin. 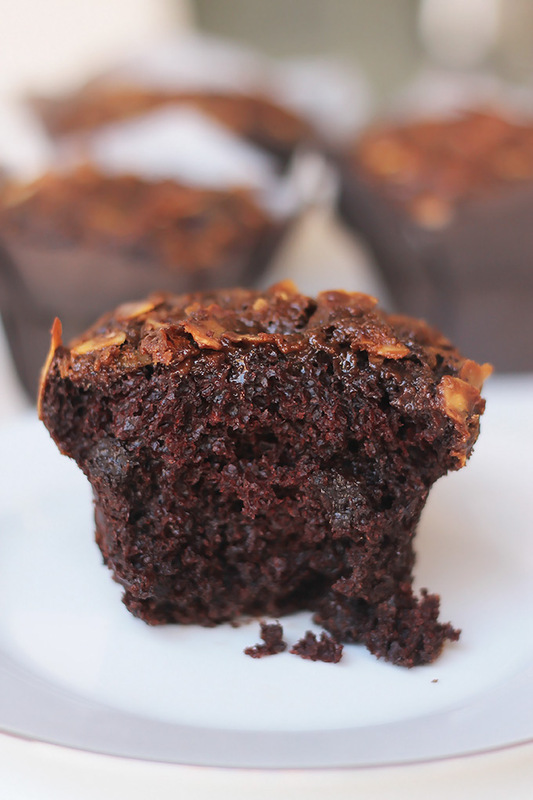 This muffin has layers and layers of chocolate goodness, that will have you licking your fingers. The idea for this recipe came to me in the middle of the night, but isn’t that when all great ideas are born, oh and let’s not forget about the shower. I made it three times before getting it right, and trust me it is right, based on the feedback from my taste testers. They couldn’t believe they were vegan. The batter is filled with cacao powder, shaved chocolate, chocolate chunks and coconut flakes. Streusel topping has vegan butter, coconut sugar, flour and coconut chips. The glaze is made with coconut cream, maple syrup, and cacao powder. 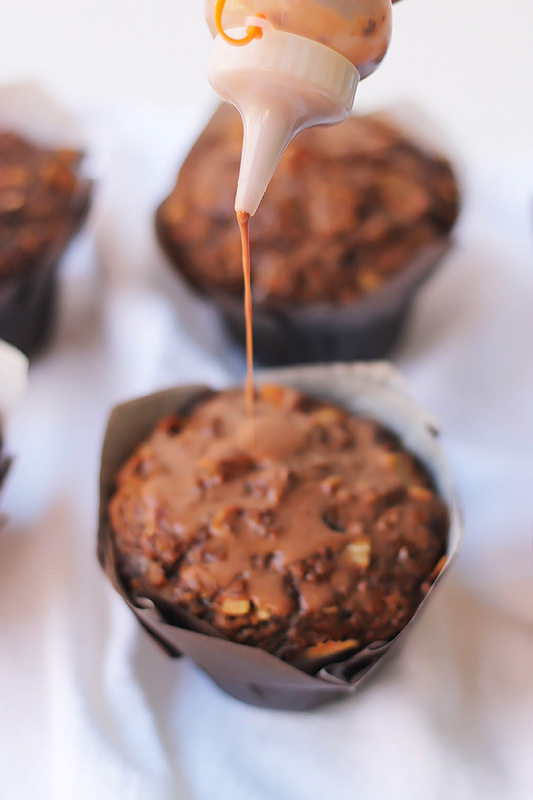 When the glaze is absorbed into the muffin it becomes crazy, over-the-top delicious. Look at all the moist deliciousness! Warning, you may have an out-of-body experience while eating one of these. Only problem, it’ll be gone before you know it. In a medium bowl, mix together vegan butter, coconut sugar, flour and coconut chips with the back of a fork or your fingertips until mixture forms small crumbs, set aside. For these muffins I used an over-sized parchment muffin cup, by Paper Chef, you can find them at any cooking store or here. Add the milk and vanilla and mix well using a hand mixer. Add the cacao powder and oil and mix well. Using a spatula fold in the coconut flakes, shaved and chunk chocolate, until well combined. Fill muffin liners to the bottom rim of liner. Sprinkle the streusel evenly on the top of batter. Bake for 25 to 30 minutes or until toothpick inserted in center comes out clean or when top of muffin bounces back when touched. 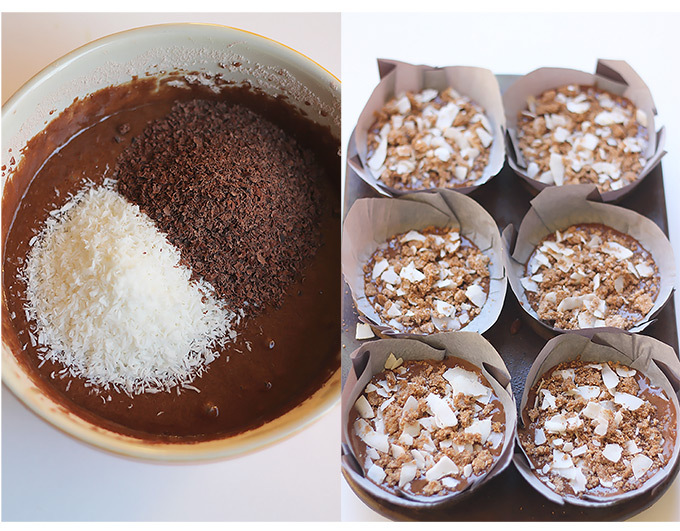 While muffins are baking mix together the coconut cream, maple syrup and cacao powder until well combined, set aside. Allow muffins to cool for 10 to 15 minutes before pouring on the glaze. The glaze will be absorbed into the muffin. This muffin was an eye opener for me! Healthy can be delicious and thanks to Celeste, now I can have my cake and eat it, too! I will have extras at the center today, come and enjoy! Put my name on one! I took some to my co-workers today and they were gone in a flash, they’re that good. Enjoy! These look so delicious! I know my husband and kids would LOVE them! Would be so happy if you shared any of your recipes at our Thursday party please 🙂 Have a great week! I would love to share at your link-up! Thanks for stopping by and enjoy the muffins. 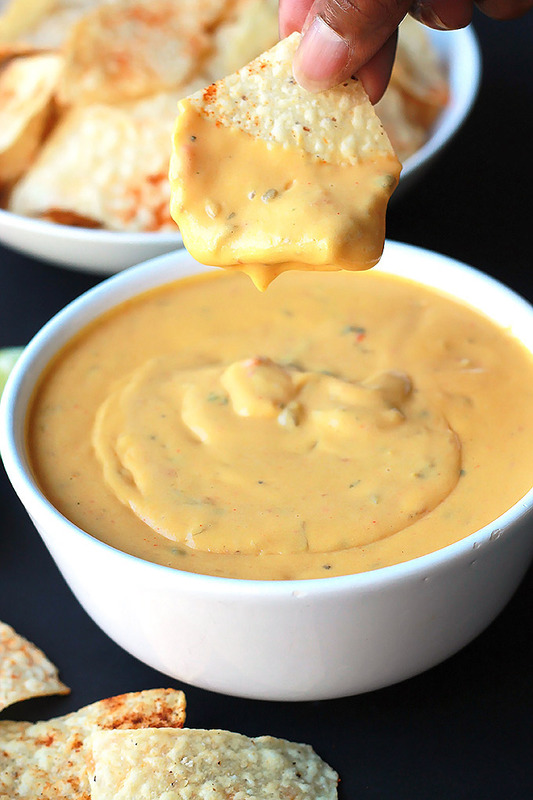 Can I do this without the oil, substitute applesauce or banana? I’m sure you can, it may change the density. I think the applesauce will work the best. I will test it with the applesauce and let you know. Holy YUM!! 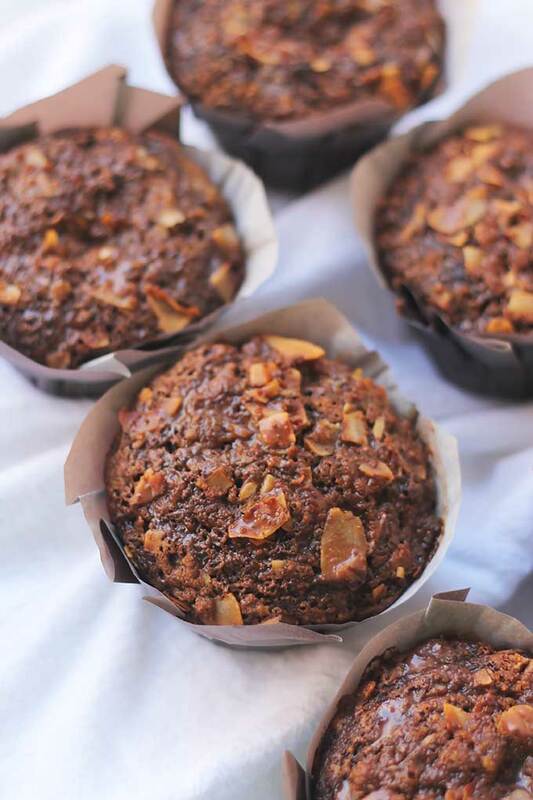 These muffins look insanely delicious, and now you’ve got my stomach growling…wish I had one to stuff in my face right now! 🙂 Pinned! They are really good, my daughter and I debated over who would get the last one in the house. This is definitely going on my must try list! Thanks for sharing at the party. 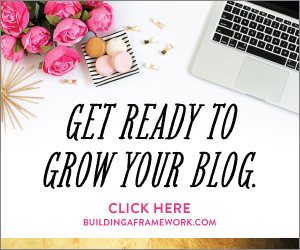 Pinned…..
You take some beautiful photos! These muffins look out of this world good! Pinning! Thanks for linking up to Show Me Saturday.